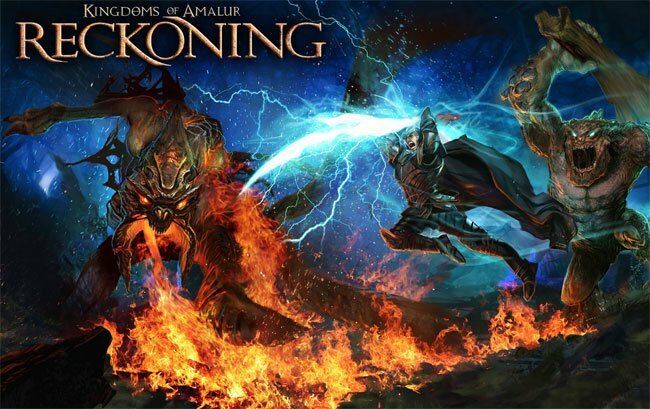 If you are looking forward to the launch of the highly anticipated Kingdoms of Amalur: Reckoning game launch next week. Then this tasty launch trailer will definitely why your appetite a little more before it arrives on the 7th February. Kingdoms of Amalur: Reckoning is a new single-player action role-playing game for Microsoft Windows, PlayStation 3 and Xbox 360, which has been developed with the help of the Ken Rolston, the lead designer of The Elder Scrolls III: Morrowind and The Elder Scrolls IV: Oblivion, who has been the games executive designer. Watch the trailer for Kingdoms of Amalur: Reckoning after the jump for a glimpse of what you can expect. Kingdoms of Amalur will features 5 distinct regions, 4 playable races, and 3 class trees with 22 abilities per tree.The 4 playable races include the Almain who are noble Humans, the Ljosalfar – Light Elves, the Dokkalfar – Dark Elves, and the Varani who are nomadic Humans. The 3 class (or ability) trees are Might, Finesse, and Sorcery; they correspond to the fighter, rogue, and mage classes respectively. Enjoy! !